As much as I love to cook, I'm always on the lookout for quick & easy meals that I can whip up fast. Meats always seem to require the most time & effort when it comes to preparing meals, so I love finding pre-cooked options that I can quickly grill or heat up when I'm in a pinch. The meats I have to share with you today are some of my favorite finds. They're perfect for any Paleo or clean eater, as they have super simple ingredient lists that are free of added junk. Each of the products I want to share with you guys today are Paleo-friendly & 100% Whole30 compliant. If you're unfamiliar with the Whole30 program, I highly recommend checking out their website (www.whole30.com). Basically, it's a 30-day nutrition program where you eat super-strict Paleo. No gluten, grains, dairy, soy, added sugars (of any kind), legumes, certain oils, etc. The focus is on eating real, whole, nutrient-dense foods that your body needs. It's a great way to jump start a healthy lifestyle, or to reboot your system. I completed my first Whole30 a few months ago, and loved both the mental and physical results I felt. I did, however, find grocery shopping to be a little tricky at first. It's crazy how many little fillers and random ingredients are snuck into foods you would least expect to find them in. After lots of time spent inspecting packages for non-Whole30 ingredients, I feel like I've got a pretty good grip on which foods might contain certain bad ingredients; and where to look for some good options without spending hours in the grocery store! I thought I would help those of you who are on a Whole30 journey, or just trying to eat squeaky clean Paleo, by taking out the guess work & coming up with some lists of foods to look for. Let me know if there are any other food categories you'd like to see (snacks, bars, etc.) & I would be happy to help! Just a Tip: When shopping for meats, look out for hidden sugars, starches, nitrites, MSG, & carrageenan. 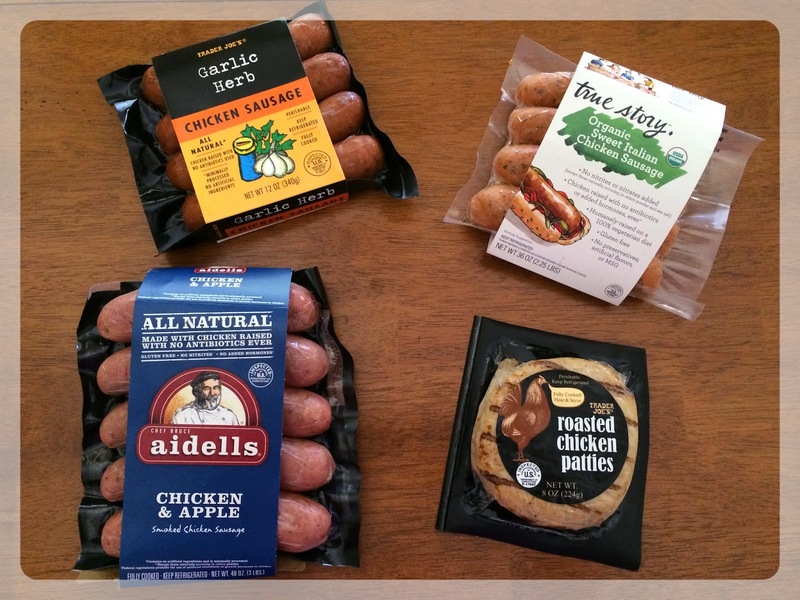 Trader Joe's Garlic Herb Chicken Sausage: Great savory flavors perfect for breakfast on its own or scrambled with eggs, or grilled & served over salad for lunch or dinner. True Story Organic Sweet Italian Chicken Sausage: I love that these are organic & made with such simple ingredients compared to some Italian sausages out there. Perfect to sauté with some bell peppers and onions! I find this brand in a giant pack at Costco for a really good deal. Trader Joe's Roasted Chicken Patties: These are awesome to heat & toss onto a salad, or eat as a main protein with some sides for dinner. I love that they are fully cooked and already spiced to perfection! are the chicken patties compliant? I thought I saw canola oil in the ingredient list so I put them back when I was at TJ's the other day.